When's the last time you read about a piece of organ music in the newspaper? Wait, never? Now's your chance. Remember that guy who got fired from Westminster Abbey recently for saying disparaging things about John Rutter? He's in the news too.
. . . the music at weddings lives or dies at the hands of the organist (in my youth I wrecked quite a few with my approximation of Mendelssohn’s Wedding March) and here Will took no chances. Edward Tambling, assistant director of music at Spanish Place, has the most impeccable technique and judgment. As an organ scholar at Westminster Abbey, he got into hot water for using ‘colourful language’ on a Facebook page to describe the nauseating clotted harmonies of John Rutter. Good man! As we took our places, out roared my favourite E-flat major chord — the opening of Bach’s ‘St Anne’ Prelude and Fugue BWV 552. Nothing in Bach’s organ music surpasses the grandeur of this work. Thompson, Damian. "Wedding music lives or dies at the hands of the organist". The Spectator, London. 20 September 2014.
. . . an immersive multi-sensory performance from Johnnie Walker, featuring flame-throwers, 10,000 year-old ice, and Jude Law -- not all at the same time. But the star attraction is a bespoke organ that reportedly employed around a quarter of the world's specialist craftsmen for the instrument during a building process that took three years and 10,000 man hours. This is the 'Flavour Conductor,' a landmark for synesthetic experiment that combines cutting edge science with a devotion to enhanced pleasure. Monks, Kieron. "Magical organ gives 'musical taste' a new meaning". CNN. 19 September 2014. The actor Donald Sinden has died. There is a sea change in how we are defining the word liturgy, and our understanding of its Greek roots. The recently-used definition "the work of the people" is going the way of the dodo in favor of what many say is the original sense of that word: "work for the people". What did Litourgeia really mean? – a litourgeia, in Greek usage, typically referred to a piece of work that was patronage for the purposes of public good. So, for instance, if a wealthy person or group of people wanted to sponsor something for the town, they might initiate the building of a town hall – the work was initiated by some people, but was for the benefit of all the people – and really, that meant all. It meant public – so that its benefits were available to everyone. If we use “liturgy – the work of the people” merely as a mandate to shift the balance of power inside the four walls of the Church, we have missed the point entirely. The really radical stuff begins when we understand that liturgy – a work of worship – is supposed to have public benefits. It's a new era. Congregational participation isn't the golden standard any more. The implications of this word are so much bigger than that. It's not about "power" among the churched. It's about doing work that is for the whole world. No one is denying that it is work, though. "The aim of liturgy is not community among worshipers. Rather, our liturgy is for God and the whole world. Liturgy does not mean “work of the people” but rather “work for the public good.” In other words, it’s not about you." Enjoy this funny song "So you want to go back to Egypt" with many manna references just in time for Proper 20A (track 1). The Evangelical Christian singer-songwriter is an interesting character: Keith Green, who died in a plane crash at only age 28. The aim of liturgy is not community among worshipers. Rather, our liturgy is for God and the whole world. Liturgy does not mean “work of the people” but rather “work for the public good.” In other words, it’s not about you. Whether we “like” the Peace or whether the local church “likes” the Peace is perhaps interesting but certainly not very important. The point of what we are doing is to carry out Christ’s commands to us, to be nourished for our Christian ministry in the world, and to pray for the good of the whole world. In this worldview, reconciling with our neighbors before we share Communion matters. Mere social niceties have no place before we do one of most important things we humans can do in our earthly pilgrimage. Gunn, The Rev. Scott. "The Peace and how we fail to pass it". Seven Whole Days. 15 September 2014. We have noted previously on the blog (see flower - summer's) the seldom sung stanza of "Praise, my soul, the King of heaven", that marvelous paraphrase of Psalm 103. Wikipedia tangent: By the way, did you know that "Praise, my soul, the King of heaven" has its own Wikipedia article? How many other hymns have this distinction? This is a notable hymn, apparently, having been sung at "the 1947 royal wedding of Elizabeth II and Prince Philip, Duke of Edinburgh." One assumes that the stanza in question was included then. The time has come to actually sing this, I think. It's about that time of year, of course, the autumnal equinox falling on Tuesday, September 23 this year. We're editing that Hallelujah to "Alleluia" so that it matches the Hymnal 1982. The stanza serves the hymn, we think, with only a little kink in the syllabification being the line that begins "Our God . . ." That "Our" gets a little too much emphasis for our taste. There are also musical/choral reasons for singing it. A (softer) organ accompaniment for unison singing of treble voices (st. 3 in the Hymnal 1982, but note that Goss's indication for trebles is not included). A different accompaniment for unison singing for the final stanza. Singing the "Frail as summer's" stanza as st. 4 allows the replication of the four part version of the harmony, which adds a very nice symmetry to the hymn, we find. But this stanza is not included in any hymnals that we can find. Do you know of one that uses it? There is a surprising passage in recently published book Slow Church that ties together improvisation, Tina Fey, N. T. Wright, the Rev. Sam Wells and the Church, which is just marvelous. Readers of the Blog at Sinden.org know that we are somewhat preoccupied with the notion of improvisation from a musical perspective, yet we concede that actors also improvise. Musicians and actors alike can surely relate to the Slow Church authors' statement about improvisation "one can never tell the turns it will take or where it will end up". Also useful for musicians are Tina Fey's rules for improvisation in her memoir Bossypants, paraphrased by the authors. Don't just say yes, say "YES, AND." It's your responsibility to contribute. "THERE ARE NO MISTAKES, only opportunities." 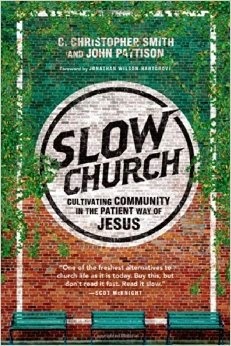 The authors of Slow Church reappropriate this as "an allusion to God's eschatological reconciliation of all things." The authors then couple this to N. T. Wright's history of creation as a drama in five acts (from his Scripture and the Authority of God). "The implications," write the authors of Slow Church, "are profound, if for no other reason that it undermines our cultural impulse to be consumers and spectators rather than faithful participants in the unwritten fifth act of God's play." Then follows a characteristically obtuse quotation from Wright about continuity with previous acts, but also that "such continuity also implies discontinuity, a moment where genuinely new things can and do happen." I have to say that I am particularly drawn to this idea of implied discontinuity. And I think this may be the kernel of what makes good art. If something is totally expected it isn't art, it's muzak. Rant Especially for Organists: Just think of the endless heap of vapid hymn preludes with which organists and -- sadly -- congregations are familiar. You know the type. They're published by Augsburg Fortress or someone like that. They don't say anything. They don't innovate. Full of parallel sixths. Most organists could improvise something more interesting. They're just background noise for the liturgy. Background noise with a comfortable, recognizable tune. Is this art? Is this the best we can do? Is this really worthy of our worship? Okay, rant over. After this, we must concede the usefulness of seeing improvisation from a theatrical perspective. The authors quote Improvisation: The Drama of Christian Ethics by the Rev. Sam Wells. Improvisation in the theatre is a practice through which actors develop trust in themselves and one another in order that they may conduct unscripted dramas without fear. The Church as "a community of trust"; "learning to improvise the scriptural plotline". We are the actors – and musicians, for music always has a role in good drama – creating the Fifth Act: The Church. No wonder that Apple ad line from the 1989 film Dead Poets Society resonates with us. ". . . that the powerful play goes on and you may contribute a verse."